Then came the first of many courses for the evening. This was apparently a last-minute special when they found out about my birthday... and another very generous gesture from Uwe. Beluga - coming from the first harvest after 17 years. I tasted some of these on their own, and other spoonfuls were placed on blinis. I do have to say, though, that while I was very grateful for Uwe's generosity, I probably should have just given my portion to Babu. 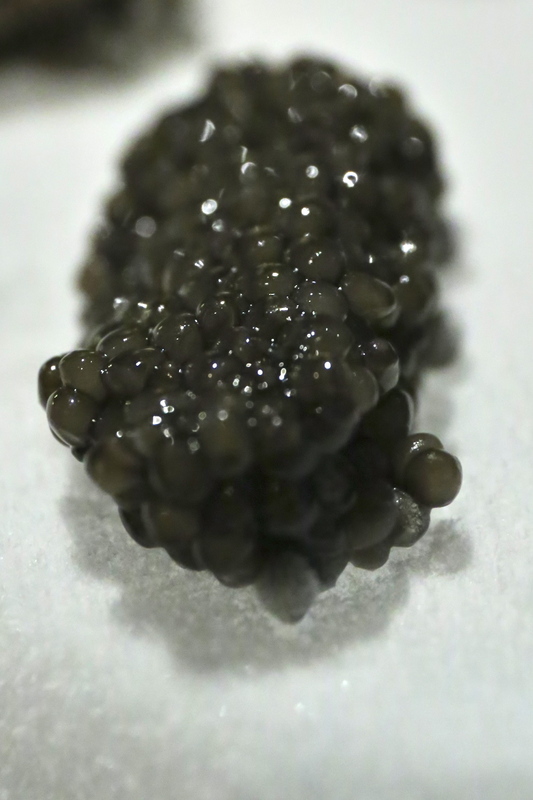 Babu is a huge fan of caviar, and truth be told... my palate isn't fine enough to detect all the nuances between the different types of caviar. At least, not tonight. 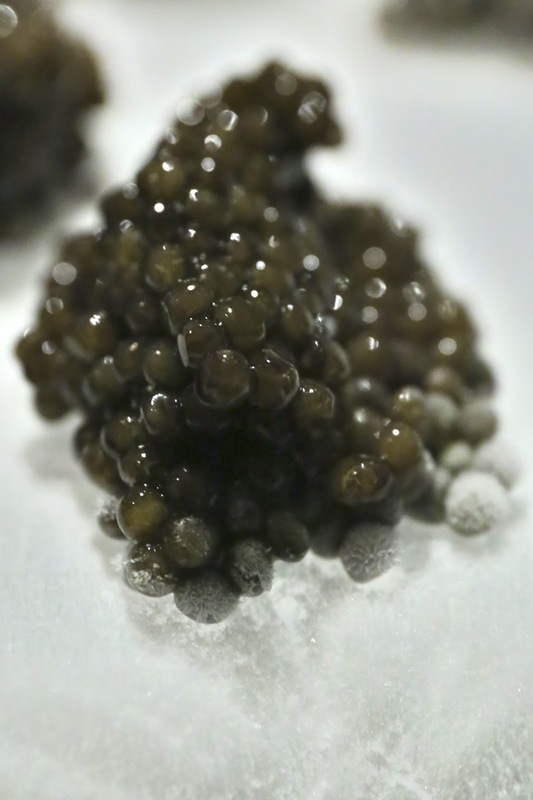 Hands - I had seen pictures of these posted on social media from friends' visits to the Krug Room. 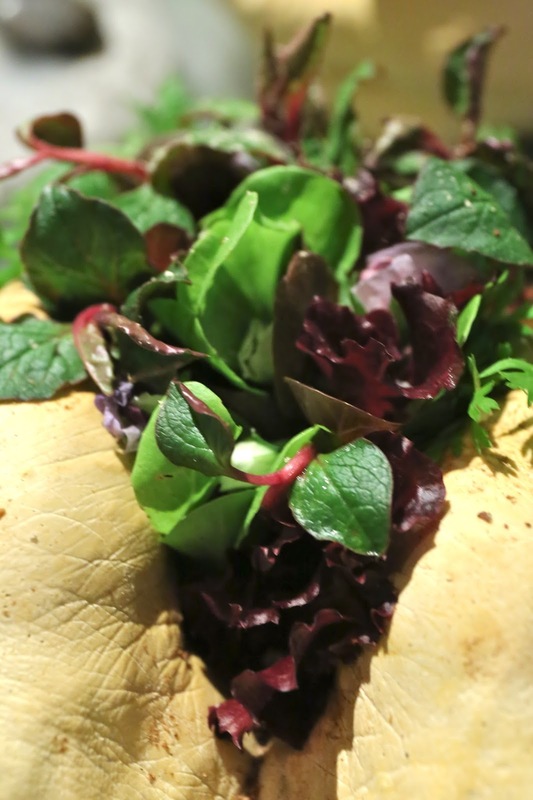 These represent farmers' hands, as the Mandarin has now begun to source their vegetables, herbs, and flowers from an organic farm on Cheung Chau (長洲). Pea tarts - very nice and sweet peas. Flower pot : organic, soil, cress, salad, kombucha, camomile - now the signature salad, with brown and green "soil" at the bottom. Camomile and kombucha dressing. 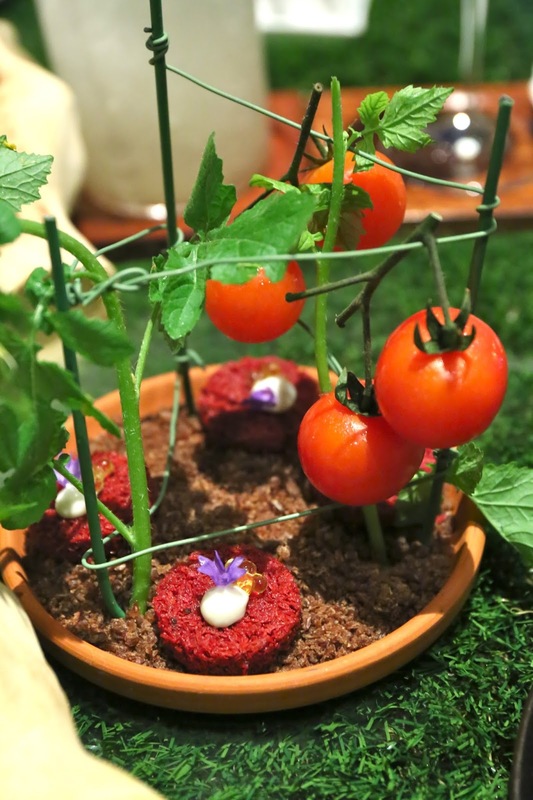 Tomatoes - tomatoes on the vine, with freeze-dried tomato sponge at the bottom, topped with olive oil caviar. Radishes - with garlic herb butter. Baby carrots - with crème fraîche and chives. Mini taco shells - with herbs and cresses and truffle. New potatoes - steamed with the same soil they were grown in. Complemented with organic sea salt from a Japanese farm. Gotta say these flakes were pretty big! White asparagus - coming from Uwe's mother. Yum. Cauliflower - battered and fried, with Madagascan spices. Very yummy. Escargot - of course, there are snails in the garden, too! With mushrooms and flowers on top. Anyway, I still love this. Fragrant with clean, pure flavors. And pretty to look at, too. Scallop : Japanese, seared, salad - the Japanese scallop is served two ways, with a sprinkle (ふりかけ) of sesame seeds, nori (のり) seaweed, and smoked paprika on the side. Marinated in kombucha and served with a salad. And also seared on a hot stone. Red mullet : French, clam, mussel, squid, octopus - the red mullet was covered with a layer of lardo on top. Incredibly, as big of a fan as I am of lardo, I actually wished for crispy red mullet skin instead... and the mullet was ever-so-slightly on the overcooked side. There was shellfish ragù with mussels and razor clams. On the side was an octopus salad with gazpacho, along with some croûtons. 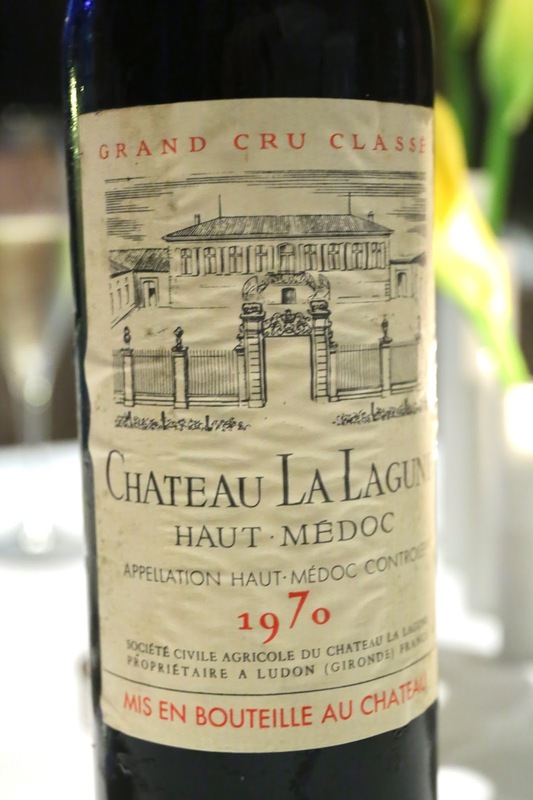 1970 La Lagune - birthday means birth-year wine, so I fished this out of my cellar for this quiet evening. Opened for 1 hour without decanting. Nice acidity and still some tannins here, but otherwise a pretty typical claret. Pork : Spanish, suckling - look at this beautiful chunk of suckling pig... and that crackling! This was chopped into a few pieces and served with a fennel salad and a couple of dots of apple sauce. There was also of quenelle of homemade kimchi mixed with panko (パン粉). The suckling pig was incredibly succulent and tender, although the crackling was slightly on the salty side. I thought the kimchi/panko mix paired really well with the pig. Beef : U.S., Brandt, short rib, cutlet, artichoke, girolle - this came with both a slice of côte de bœuf (which would be the daintiest piece of côte de bœuf I have ever seen) and piece of short rib slow-cooked for 36 hours. Served with artichoke slices, crispy artichoke chips, and girolles. Jus and homemade tomato paste on the side. Not surprisingly, the short rib was very, very tender. The côte de bœuf, however, was surprisingly a little tough and chewy... due to the specific cut and not as a result of overcooking. Cherries - I had apparently complained about not getting these (although I have no recollection of that...) so Uwe decided to send me some cherries. Pitted, of course, with stems made of candy. Served on a bed of cream. Very nice. ...which yields not slices of savory ham but ice cream made to look like ham. Another fun dish. 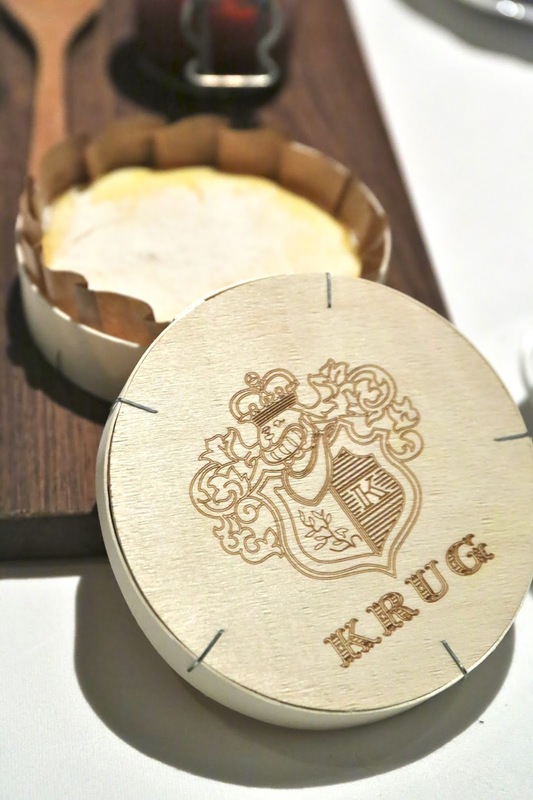 The "cheese" is actually a warm cheesecake, which was so liquid that it almost resembled a fully mature Cabri Ariégeois or Vacheron-Mont d'Or... where one just spoons it from the container. Soooooo rich... I wish I had more room in my stomach. 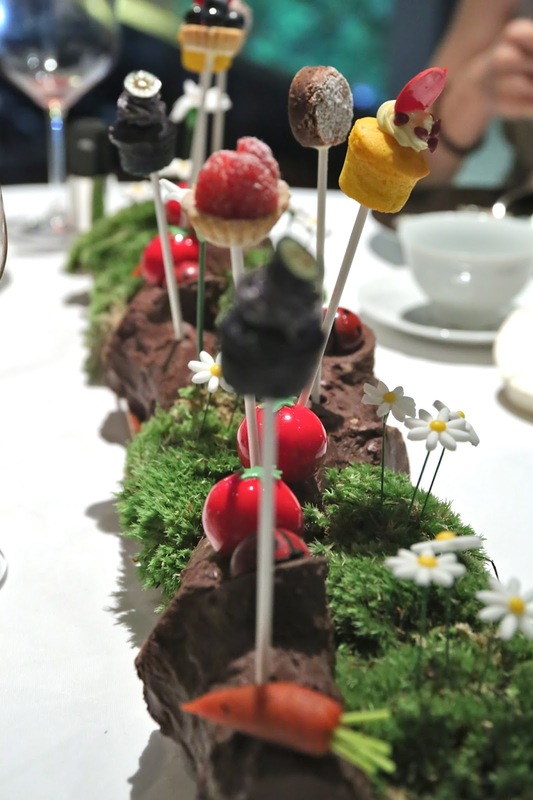 Once again Uwe presented us mignardises in a setting resembling a garden in spring and summer. We got some "tomatoes", made with what seemed to be Marscapone cheese filling. And chocolates looking like lady bugs. Also "carrots" made with what seemed similar in texture to marzipan. Plus lots of bite-sized muffins, daisies made of sugar...etc. There was no hope of us finishing them, so we asked the staff to pack them away for my godson Bear. This was a lot of food... AGAIN. I was pushed almost to the point where I would be tempted to call an ambulance, but thankfully didn't cross that line tonight. Many, many thanks to Uwe, Ken, and everyone for a very fun evening.